Offering you a complete choice of products which include retino ac gel, supatret 0.04 gel, retino a 0.05% cream, supatret 0.01% gel, isotane caps and benzac ac cream. We are the Leading suppliers of Retino Ac Gel. 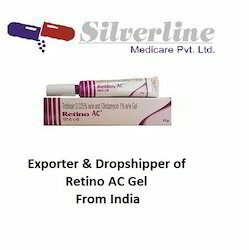 We also do Drop Shipping of Retino Ac Gel. Retino Ac Gel is used for Acne, Bacterial infections of skin, Wrinkles, Dry, Rough patches and tiny bumps on skin, White blood cells cancer, Lower respiratory tract infections and other conditions.Retino Ac Gel contains Clindamycin, and Tretinoin as active ingredients. The most commonly reported side-effects of Retino Ac Gel are dry skin, higher levels of blood fats, increased or decreased skin pigmentation, swelling, conjunctivitis or dry eyes, and chest pain or abdominal pain.The following is a list of possible side effects that may occur from the use of Retino Ac Gel. This is not a comprehensive list. These side-effects are possible, but do not always occur. Some of the side-effects may be rare but serious. Consult your doctor if you observe any of the following side-effects, especially if they do not go away. 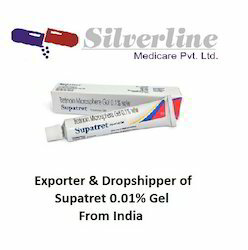 We are the Leading suppliers of Supatret 0.04 Gel . 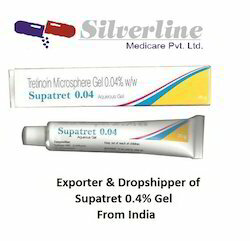 We also do Drop Shipping of Supatret 0.04 Gel. Supatret 0.04% gel is used in the treatment of acneSupatret 0.04% gel works by slowing the production of certain natural substances that can cause acne. Our TRETINON 0.04% gel is a topical medication with an active Vitamin A metabolite that is used to reduce and gradually remove the appearance of wrinkles, pimples, blackheads, age spots, and the roughness of facial skin while also facilitating the disappearance of darker and lighter spots. Given its oil-free nature, it is also suitable for people with oily skin. Tretinoin must be used with a total skin care and sunlight avoidance program. FDA approved TRETINON 0.04% gel as one of the most effective drugs that minimize the signs and severity of acne vulgaris. Being the market leader in this domain, we have come up with a wide range of Retino A 0.05% Cream which has a potential use for treatment of alopecia. Offered cream also used to help reduce visible signs of ageing on the face by fading age spots and reducing fine wrinkles, as it promotes skin turnover to replace old damaged skin with new skin. This Retino A cream is used to treat acne vulgaris by preventing the formation and spread of pimples and blackheads. Supatret Gel is used for Acne, Wrinkles, Dry, Rough patches and tiny bumps on skin, White blood cells cancer and other conditions.Supatret Gel contains Tretinoin as an active ingredient.Supatret Gel works by slowing the growth of diseased blood cells. The most commonly reported side-effects of Supatret Gel are dry skin, higher levels of blood fats, increased or decreased skin pigmentation, swelling, conjunctivitis or dry eyes, and chest pain or abdominal pain.The following is a list of possible side effects that may occur from the use of Supatret Gel. This is not a comprehensive list. These side-effects are possible, but do not always occur. Some of the side-effects may be rare but serious. Consult your doctor if you observe any of the following side-effects, especially if they do not go away. Dryness of mucous membranes, dryness of skin with scaling, fragility, erythema, cheilitis, pruritus, epistaxis, conjunctivitis, dry sore mouth and palmo-plantar exfoliation. Corneal opacities, dry eyes, visual disturbances, skeletal hyperostosis and musculoskeletal symptoms. Elevation of serum triglycerides, LFTs, ESR and blood glucose. Hair thinning, photosensitivity, changes in skin pigmentation, paronychia. GI disturbances, hepatitis. Headache, drowsiness, sweating, mood changes, psychotic symptoms, depression, suicidal tendencies, benign intracranial hypertension, seizures. Vasculitis, hypersensitivity reactions, IBS. Potentially Fatal: Anaphylaxis. Haemorrhagic pancreatitis. Preexisting or predisposition to hypertriglyceridaemia (e.g. DM, obesity or increased alcohol intake). Monitor triglyceride levels. Monitor blood lipids and LFTs at wkly or bi-wkly intervals. Monitor blood glucose in known or suspected DM patients. Genetic predisposition for age-related osteoporosis, history of childhood osteoporosis, osteomalacia or other bone metabolism disorders. Anorexia nervosa. History of psychiatric disorder. May impair night vision. Avoid wax epilation and skin resurfacing procedures for at least 6 mth. Avoid prolonged exposure to UV light or sunlight. 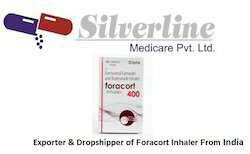 Discontinue if hearing impairment, abdominal pain, rectal bleeding, severe diarrhoea or adverse ocular effects occur. Patient should not donate blood during therapy and for at least 1 mth following drug discontinuation. Additive toxicity with vitamin A or its derivatives. Decreased efficacy of microdosed progesterone (use 2 forms of contraception). May increase risk of bone loss with phenytoin. May increase risk of osteoporosis with systemic . Reduces plasma levels of carbamazepine. Potentially Fatal: Increased risk of pseudotumor cerebri with tetracyclines. 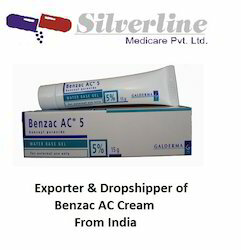 Benzac AC is an effective benzoyl peroxide based treatment for mild to moderate acne.The active ingredient in Benzac AC, benzoyl peroxide helps unblock pores and kills acne bacteria within 48 hours. There are 3 strengths of Benzac AC Gel. 2.5%, 5% and 10%. The percentage refers to the amount of the active benzoyl peroxide in the gel.It is recommended that you always begin treatment with either 2.5% or 5% Benzac AC. If your acne persists, and provided your skin tolerates the lower strength gel, your doctor or pharmacist may recommend continued treatment with the higher strength gel (10%).How long you will need to use Benzac AC will depend on how quickly your condition improves. After you have used it for one month, you should see your doctor or pharmacist again so they can check the improvement in your condition. Benzac Gel Ingredients:Each gram contains:Active: benzoyl peroxide 25mg/g Inactive: docusate sodium, disodium edetate, poloxamer 182, carbomer 940, propylene glycol, acrylates copolymer, glycerol (glycerine), silicon dioxide, sodium hydroxide, and purified water. What is Persol 5% Gel? Persol Gel works by killing bacteria to reduce inflammation and allowing the skin to exfoliate. This will help break down whiteheads and blackheads as well as unblocking pores. The active ingredient benzoyl peroxide is considered a keratolytic type of medication and can be used alone or along with other medicines to treat mild to moderate acne. How is Persol 5% Gel used? Persol Gel should only be applied topically as directed by a doctor, usually 1 to 2 times per day. Contact a doctor for the correct dosage and length of treatment as it will depend on the condition being treated and the patient?? ?s response to the therapy. Prior to using the medication, it is advised to clean your hands and the affected area with a mild cleanser and patted dry with a towel. Spread a thin layer of the medication on the affected area and gently rub it in until it is fully absorbed. Wash your hands immediately after applying the gel. Do not use the gel excessively as it will have an adverse effect and increase the chance of irritating the skin. Persol 5% Gel is not always suitable for all patients. Always consult your health care provider prior to using this medication if you are pregnant, breastfeeding, trying to conceive, using any other medication (prescription or non-prescription), using any herbal products or supplements, or if you have any allergies or other health problems. Benoquin cream contains monobenzone (monobenzyl ether of hyquinone) that works by causing free-radical formation in the skin and this causes destruction of remaining melanocytes. 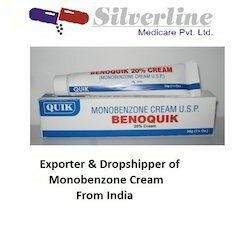 Monobenzone in Benoquin cream also acts by inhibiting the tyrosine enzyme that is involved in the production of melanin, the pigment that gives colour to the skin. As the amount of melanin produced decreases the areas of normal skin gradually lighten to match the patches of vitiliginous paler skin. Tacrotor 0.03% Ointment is an immuno-suppressant which is used in kidney, liver, and heart transplant patients. It should be used under the supervision of a qualified physician. Close monitoring of blood pressure is necessary while receiving this medicine. Tacrotor 0.03% ointment is an immunosuppressant that works by decreasing the activity of body's immune system. Lightening freckles, age spots, and other skin discolorations associated with pregnancy, skin trauma, birth control pills, or hormone replacement therapy. It may also be used for other conditions as determined by your doctor. Hydroquinone cream is a skin-bleaching agent. It works by inhibiting an enzyme reaction in skin cells. 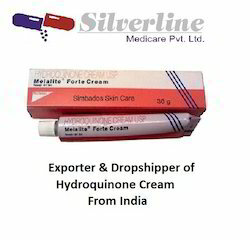 Some MEDICINES MAY INTERACT with hydroquinone cream. However, no specific interactions with hydroquinone cream are known at this time. This may not be a complete list of all interactions that may occur. Ask your health care provider if hydroquinone cream may interact with other medicines that you take. Check with your health care provider before you start, stop, or change the dose of any medicine. Hello Ladies! This is my first review for IMBB and I’m really excited to share my experiences with all of you. 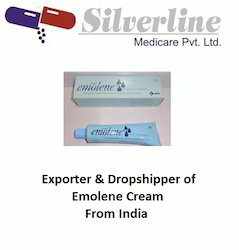 I am beginning with a very basic yet an extremely useful and effective moisturizer for all skin types – the very handy Emolene Dry Skin Cream. First Look: Recommended by dermatologists, Emolene comes in a sky blue tube and does not appear as a beauty product at all. It is and looks like one of those typical creams you’d pick from the chemists. Claims: Emolene is a hydronourisher that restores the natural moisture balance of the skin. Perfect for dry skin treatment. Texture and Fragrance: It has a light watery, mildly creamy texture with no fragrance at all. Take desired amount and gently spread it on to the face in light circular motion. Treating itching, redness, and swelling of many skin conditions. 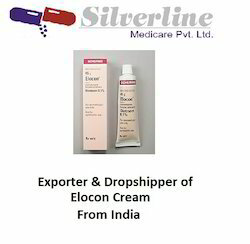 Elocon cream is a topical corticosteroid. It works by reducing inflammatory reactions and modifying immune reactions in the body. 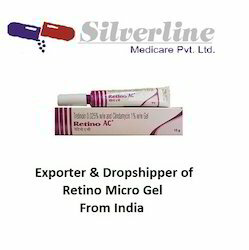 Retino A Micro Gel is a combination of the active ingredients clindamycin and tretinoin. Clindamycin, an antibiotic used to control bacteria and a form of vitamin A, tretinoin helps to reduce oil produced by the glands in the skin, which allows the skin to heal quicker. Retino AC is prescribed for adults and adolescents 12 years of age and older who suffer from severe nodular acne. Use Retino A Micro as instructed by your doctor or pharmacist. Read all instructions that come with the medication. Do not change the dosage under any circumstances, unless instructed by your doctor. Unless instructed differently by your doctor, Retino A Micro should be applied to the effect area once a day at bedtime. Do not use Retino A Micro on children or let children less than 12 years of age handle Retino A Micro. The active ingredients in Retino A Micro cause your skin to become more sensitive to UV light and will increase the chance of sunburn. If you must exposed your skin to prolong periods of time in the sun, be sure to apply a good sunscreen and wear protective clothing such as long sleeves and a hat. Wash your hands and face thoroughly with a mild soap and pat rather than rub your face dry with a soft towel. Apply a dab of medication about the size of a pea to the entire face. To avoid skin irritation, do not wash your face more than three times a day. Irritating the skin could cause the acne to become more inflamed. If you apply more than prescribed contact your doctor as soon as possible or get immediate medical attention if you suffer a reaction. 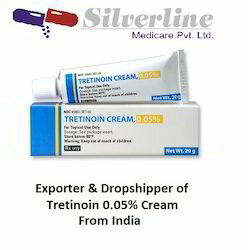 We are the Leading suppliers of Tretin 0.05% Cream. 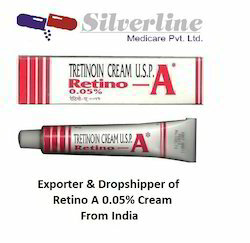 We also do Drop Shipping of Tretin 0.05% Cream. 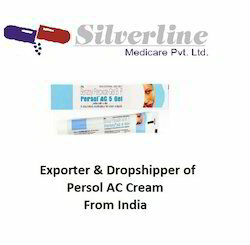 Initial exacerbation of symptoms, skin irritation, stinging on application, oedema, blistering, crusting of the skin, erythema, scaling, photosensitivity, temporary hypo/hyperpigmentation. Oral: Haemorrhage, reversible hypercholesterolemia and/or hypertriglyceridemia, acidosis, hypothermia, pseudotumour cerebri, infection, dizziness, paresthesias, anxiety, dryness of skin and mucous membranes, nausea, vomiting, GI haemorrhage, mucositis, decreased appetite, rash, pruritus, increased sweating, alopecia, bone pain, peripheral oedema, renal insufficiency, earache, visual disturbances, neurotoxicity. Potentially Fatal: Retinoic acid syndrome, cardiac arrthythmia, disseminated intravascular coagulation, blood dyscrasias, cardiac arrest, cerebral haemorrhage. Enhances percutaneous absorption of minoxidil. Increased risk of fatal thrombotic complications with antifibrinolytic. Increased tretinoin concentrations with azole antifungals. Enhances peeling action of sulphur, resorcinol, benzoyl peroxide, salicylic acid. Increased photosensitivity with photosensitising medications eg, thiazides, tetracyclines, fluoroquinolones, phenothiazines and sulfonamides. Potentially Fatal: Increased risk of intracranial pressure with tetracyclines. We are the Leading suppliers of Triglow Cream. 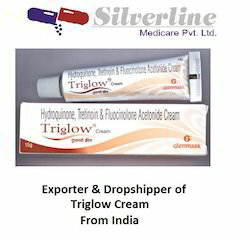 We also do Drop Shipping of Triglow Cream. Triglow Cream is used for Lightens light brown color patches on skin, Acne, Age spots, Skin infections, Wrinkles, White blood cells cancer and other conditions.Triglow Cream contains Fluocinolone, Hydroquinone, and Tretinoin as active ingredients. The most commonly reported side-effects of Triglow Cream are allergic reaction, skin reaction, itchy, inflamed skin, mild to moderate irritation, and sore.The following is a list of possible side effects that may occur from the use of Triglow Cream. This is not a comprehensive list. These side-effects are possible, but do not always occur. Some of the side-effects may be rare but serious. Consult your doctor if you observe any of the following side-effects, especially if they do not go away. Fusidic acid is active in vitro against Staphylococcus aureus, most coagulase-positive staphylococci, Beta-hemolytic streptococci,Corynebacterium species, and most clostridium species. Fusidic acid has no known useful activity against enterococci or most Gram-negative bacteria (except Neisseria, Moraxella, Legionella pneumophila, and Bacteroides fragilis). Fusidic acid is active in vitro and clinically against Mycobacterium leprae but has only marginal activity against Mycobacterium tuberculosis. 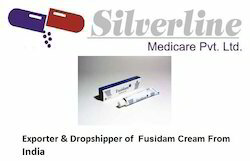 One important clinical use of fusidic acid is its activity against methicillin-resistant Staphylococcus aureus. Many strains of MRSA remain sensitive to fusidic acid, but, because there is a low genetic barrier to drug resistance (a single point mutation is all that is required), fusidic acid must never be used on its own to treat serious MRSA infection and should be combined with another antimicrobial such as when administering oral or topical dosing regimens approved in Europe, Canada, and elsewhere. However, resistance selection is low when pathogens are challenged at high drug exposure. 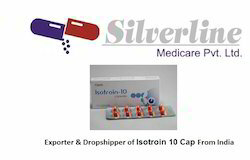 An orally-administered mono-therapy with a high loading dose is under development in the United States. 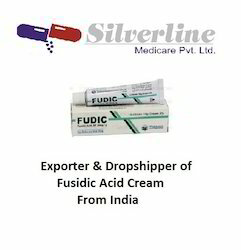 Topical fusidic acid is occasionally used as a treatment for acne vulgaris. As a treatment for acne, fusidic acid is often partially effective at improving acne symptoms. However, research studies have indicated that fusidic acid is not as highly active againstPropionibacterium acnes as many other that are commonly used as acne treatments. Fusidic acid is also found in several additional topical skin and eye preparations (e.g. Fucibet), although its use for these purposes is controversial. Fusidic acid is being tested for indications beyond skin infections. There is evidence from compassionate use cases that fusidic acid may be effective in the treatment of patients with prosthetic joint-related chronic osteomyelitis. We are the Leading suppliers of Melamet. 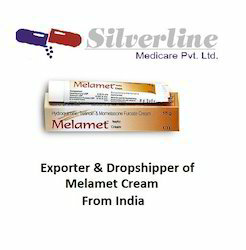 We also do Drop Shipping of Melamet. Melamet the "3 Way Solution" skin care cream. It is an excellent combination of the 3 best skin care ingredients on the market: 2% Hydroquinone (lightener, bleacher) + 0.025% Tretinoin (skin peel, acne and wrinkles) + 0.1%Mometasone Furoate (mild corticosteroid - anti innflamatory, anti itching). Uses: For treating and lightening dark skin spots, melasma and other discoloration disorders and blemishes. Clears and Controls acne and wrinkles. Calms and controls Rosacea and other inflamatory skin conditions. his product seems good, its a small tube so I've been conservative and have been applying it sparingly on areas of my mug that are especially noticeable. it'll take time so I'll post a an updated review in a month. from past experience, I've noticed that the combo of tet and HQ is more effective than either one alone for lightening dark patches. i have an inherited disposition that causes melanin disruption so hopefully this stuff will help. other products such as peels have so far been ineffective. make sure to get a wide brimmed hat to protect your skin from the sun while using this. Looking for Skin Care Products 2 ?